Firefox has extensions - and so does OpenOffice. OpenOffice is a highly popular, free, cross-platform office suite that you can install and use alongside or in lieu of Microsoft Office as your software of choice for creating and editing documents, spreadsheets, presentations, and more. OpenOffice extensions allow you to ... extend the basic functionality of the software and make it more suited to your needs, better looking and more productive. The concept is similar to Firefox addons, one of the main reasons for the great popularity of the Mozilla browser. Today, we will learn how to boost our OpenOffice with fresh looks and new tricks. To learn more about OpenOffice, you may want to read my review. Now, follow me. OpenOffice.org repository for Extensions is the place you want to go. 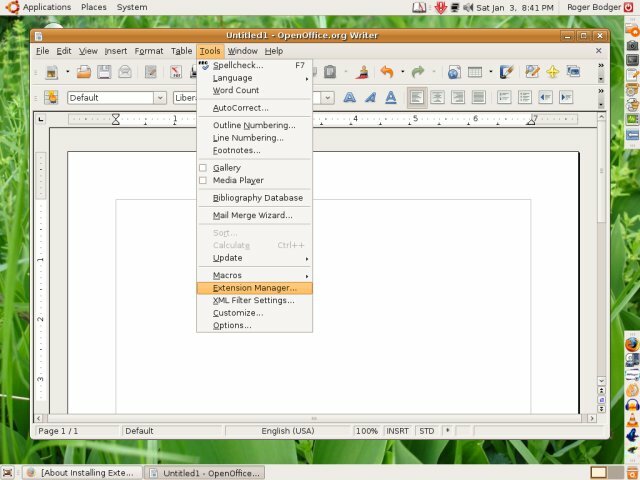 This website contains a comprehensive list of all available extensions that you can use for your OpenOffice suite. You can search for extensions based on their popularity, rating, recency, or even compatibility with specific operating systems. Furthermore, when you launch OpenOffice, you can also install extensions from the Start Center. What you're interested in second button on the left in the bottom right corner. Clicking on it will take you to the repository. This extension allows you to work with PDF documents which original sources you no longer have - or never did. Instead of copying and pasting text from PDF files, this extension allows you to retain the formatting, while adding chances to the documents. 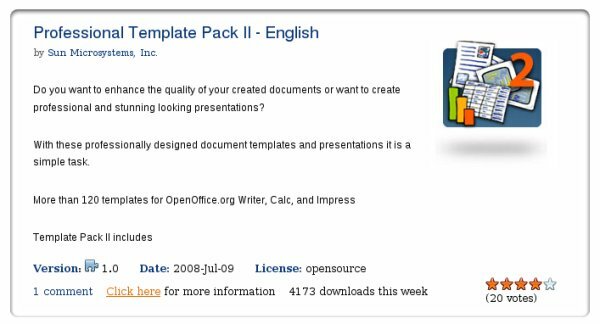 This extension offers a 100+ templates for the most popular programs, Writer, Calc and Impress, allowing to enhance the look and feel of your documents. If you do not like to create your own templates from scratch and prefer to work with existing sets, this extension is ideal for you. This extension is useful if you have multiple monitors, one of which you use for presenting to an audience. Sun Presenter Console allows you to better manage the flow of your presentations by showing only relevant material to the crowd, the actual presentation, while slide notes, a preview of upcoming slides and a timer are only visible to you. Using the Console can help make your presentation flow more efficiently, while sparing the audience the unnecessary details of "lecture management," giving your show a more professional look. P.S. Screenshots taken from the repository website ... OK, I think you got convinced. Now, let's install them! 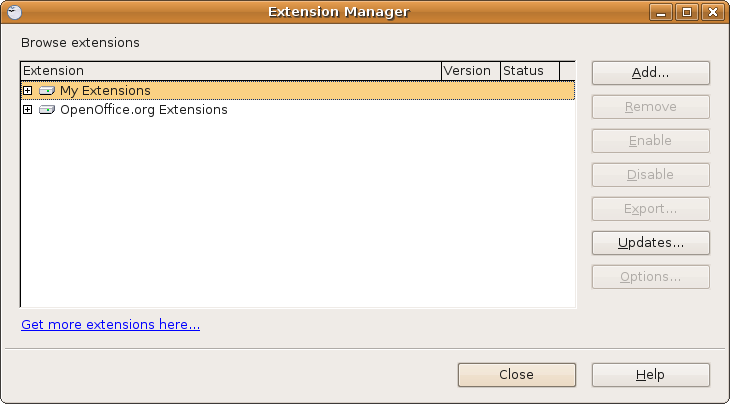 Installing extensions is very simple. First download them. Then, open any one of the OpenOffice programs. Go to Tools > Extensions Manager. Then, click Add, navigate to where you've downloaded the extensions. And enjoy! 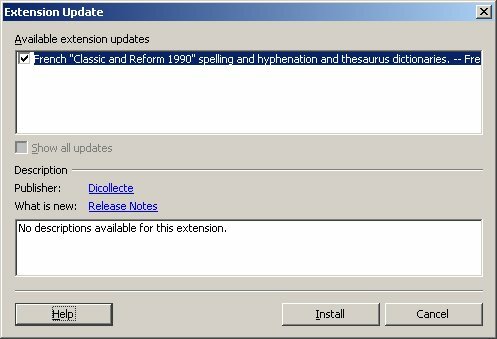 Whenever there are updates for your extensions, OpenOffice will notify you. You won't have to manually manage them. It's just like the Firefox Addons. OpenOffice extensions are a highly useful addition to an already well made, rich office suite. They allow you to easily extend the basic functionality, looks and feel of your programs, increasing productivity, efficiency and general satisfaction with your work. The modularity provided by the extensions makes the OpenOffice into an extremely potent weapon in the hands of a serious user.